If you are looking for a reliable, fuel efficient used car with good cargo space and comfortable ride, Toyota Matrix is your best bet. It's also a good choice for tall drivers, as it offers plenty of headroom in the front and back. 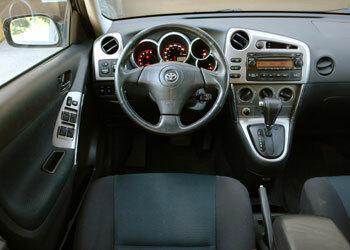 Toyota Matrix is a tall compact wagon based on the popular Toyota Corolla. The interior is practical, but materials are modest. The high driving position makes for great visibility. Rear seats fold down flat, offering 53.2 cu. 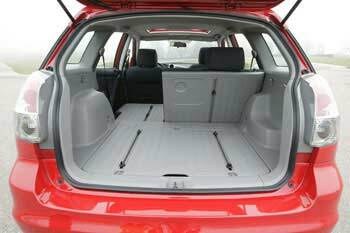 ft. of cargo space covered with a durable plastic with built-in attachments for tie-downs. The front passenger seat back flips forward, if you want to haul long items. The rear hatch window opens separately for easy access. A 115V power outlet is among available options. Mechanical: The 2003-2008 Matrix comes with front- or all-wheel drive, manual or automatic transmission. The base 1.8-liter 4-cylinder 1ZZ-FE DOHC engine is the same as in the Corolla. This engine uses a maintenance-free timing chain; there is no timing belt. The sporty Matrix XRS has a 180-hp 1.8L 2ZZ-GE motor borrowed from Toyota Celica mated to a six-speed manual transmission. Both engines are very reliable and inexpensive to maintain. Anti-lock brakes (ABS) are optional (standard on XRS). Fuel Economy: The 2005-2008 1.8L (1ZZ-FE) Toyota Matrix automatic is rated at 25/31 mpg or 9.4/7.6 liters per hundred kilometers city/highway. This means you can travel up to 396 miles (637 km) on one 13.2-gallon (50-liter) tank of gas. 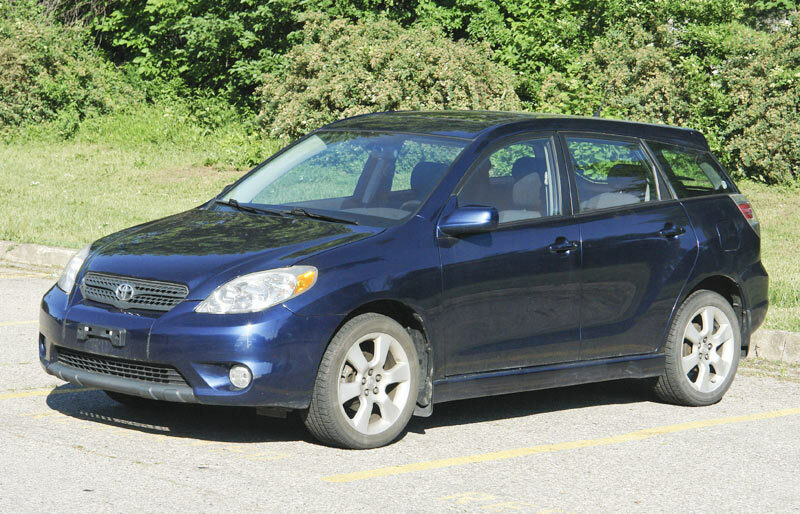 Handling and ride: Toyota Matrix offers sharper handling and firmer ride than the Corolla. The base 1.8L engine is not very quick, but works fine in day to day driving. Safety: In the NHTSA frontal crash tests, the 2003-2004 Toyota Matrix received five stars for both the driver and the front passenger. The 2005-2008 models scored five stars for the driver and four stars for the front passenger in the same tests. Pros: Practical, reliable, holds value well, good on gas, easy to maintain, flat cargo space with attachments for tie-downs, liftgate glass opens separately. Cons: Interior materials, outdated interior styling, sensitive to crosswinds, engine noise on acceleration, not the best car in the snow. Overall: If you are looking for a fuel-efficient practical car with good cargo space, you can't go wrong with the Matrix. If you find a used well-maintained Toyota Matrix in good condition, it can easily last you for a few more years without major issues. Pontiac Vibe is a mechanical twin of Toyota Matrix and can be also considered. Honda Fit, although it's smaller is another good choice for a fuel-efficient car with decent cargo space. The Fit is also reliable, but it rides firmly and is not very quiet. Toyota Matrix common problems: A bad drive belt tensioner can cause squealing and/or rattling noise coming from the engine compartment. The recommended repair involves replacing the drive belt tensioner with an updated part. The aftermarket belt tensioner is priced from $30 to $60, the OEM part is more expensive: $140-$160. It's a good idea to replace the drive belt at the same time. A leaking intake manifold gasket or can cause the Check Engine light to come on with the codes P0300-P0304, P0133 and P0171. Replacing the intake manifold gasket may cost $120-$280 in a repair shop. The service bulletin EG045-07 describes the repair. A contaminated air flow sensor can also cause the code P0171. The airflow sensor ($120-150 for OEM part) is easy to replace. There is a number of reports about problems with a manual transmission due to a faulty bearing. Harsh shift condition with the MIL light ON and the code P2716: recommended repair involves replacing the ECM (engine computer) with an updated part. There was also a recall for a faulty ECM in 2005-2008 Toyota Matrix. What to look for when buying a used Toyota Matrix: When inspecting a used Toyota Matrix, check the oil level; a low oil level could be an indication that the engine consumes oil. Watch out for engine noises. If the engine makes a loud rattling noise or there is a smoke from the exhaust when the engine is started, avoid the car. During the test drive, watch out for noises from a manual transmission; there are plenty of complaints about manual transmission problems. Read our used car buyer's checklist with photos for more tips. Before buying, have the car inspected by a mechanic of your choice. How often should you change your oil? Toyota recommends changing your oil every 5000 miles or 6 months, whichever comes first. If you want to keep your engine in good shape longer and given that it's quite common for the 1.8L engine to consume some oil, we recommend changing your oil every 3,500-4,000 miles. It's also a good idea to check the engine oil level regularly. SAE 5W-30 is the recommended oil viscosity. A cabin filter needs to be replaced every 24 months or 20,000 miles. What is the recommended interval to change automatic transmission fluid? Automatic transmission fluid should be checked regularly and changed when dirty. See how to check automatic transmission fluid. Toyota Matrix is a lightweight car; if you want better traction on snowy roads, consider installing winter tires. Transport Canada - Road Safety Recalls - check for recalls in Canada. Toyota Owners - search an owner's manual online, how-to videos, maintenance schedule.